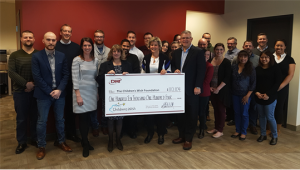 DMT Development Systems Group Inc. (DMT) has once again provided Children’s Wish Foundation, Manitoba & Nunavut Chapter with the largest corporate donation in the Chapter’s history with a record sum of $110,104. This is the third year in a row that the company, a global IT solutions provider for the automotive industry headquartered on the University of Manitoba campus, has surpassed this milestone. The donation will help Children’s Wish Foundation, which receives no government funding, fulfill a number of local wishes for children living with high-risk, life threatening illnesses. The funds are a result of DMT’s internal giving program known as “Payroll for the Needy”, which selects one charity per year as part of the company’s philosophy of giving back to the community. Driven by voluntary employee pledges, staff contributions are matched dollar for dollar by DMT. In the 14 years the organization has been running the program, it has achieved an astonishing 100% participation rate among its staff. Allie Clear and Maria Toscano of Children’s Wish Foundation, Sharon and Glen Demetrioff of DMT Development Systems Group Inc., along a group of DMT’s more than 200 employees.